Lora McDonald is the Executive Director of MORE2 (Metro Organization for Racial and Economic Equity). McDonald lives in Kansas City with her 15-year-old son. McDonald earned a Bachelor’s Degree in Social Work from the University of Missouri. At a young age, McDonald began examining racial inequity and gaining an uncommon understanding of her own white privilege. She has dedicated her career to addressing racial inequities, in partnership with people personally impacted by racism. In her two-decade career as a social worker, she has served a variety of populations: people in drug treatment; incarcerated individuals; homeless youth; foster and adoptive families; and people living in poverty. Her primary focus has always been challenging the policies, systems and programs that hinder the lives of individuals and families. In 2008, while working for the Kansas City Metropolitan Crime Commission, she began organizing around issues impacting people who were returning from incarceration, as the founder of the Kansas City Metropolitan Reentry Coalition. Simultaneously, McDonald created the Second Chance Program, serving people returning from incarceration who are deemed high risk of reoffending. In 2010, McDonald worked with the legislature to leverage a $250,000/ year line item to address housing and workforce goals of people returning to Kansas City from Missouri prisons. McDonald has successfully organized to win these criminal justice issues: Ban the Box (in KCMO, KCKS, and Johnson County, KS); Ban the Ban (eliminating the lifetime ban on food stamps for Missourians with drug offenses); removed the words “Registered Offender” from Kansas ID’s/ Driver’s Licenses; and modified the Liquor License City ordinance in KCMO, three times, to make more jobs available to people with felony convictions. In her current job at MORE2 McDonald addresses the spectrum of issues from education to workforce, from classism to racism, that led to mass incarceration. Under McDonald’s leadership, the organization has an unprecedented number of public policy victories in the area of transit, housing, education, health, workforce and criminal justice. McDonald also organizes to end mass incarceration, through the National Gamaliel Network (MORE2 is one of 45 affiliate members). McDonald is one of only two Caucasian people to ever be honored by the Missouri Legislative Black Caucus with a Community Advocate award. 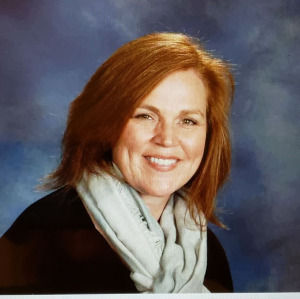 Her work has also been recognized by Proclamation from the City of Kansas City and she received the “Equality 1st Award” from the Adult Prom Committee (Kansas City, KS). In this meeting on September 6th, we will also release our endorsed candidates for the general election on November 6th, 2016. Don’t miss out! Zachary Mueller is currently the Research and Project Director at Kobach is Wrong for Kansas PAC and has released a series of reports that document the concerning political activity of Kris Kobach. He also is a regular contributor to a blog on immigration issues. He previously worked as a union organizer helping to build the Fight for $15 movement and has a bachelors degree in political science from the University of Missouri in Kansas City. 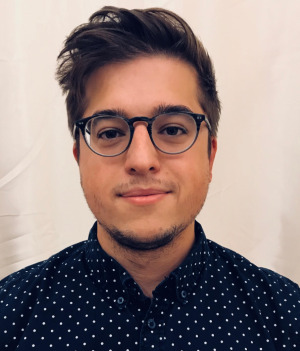 Zachary will be presenting on the political history of Kris Kobach focusing on the four pillars of his concerning politics that includes attacks on voting rights and immigrants and connections to Islamaphobia and the radical gun movement. This outline will show the threat Kobach is to our best American ideals. For more information about the Halloween party and to purchase tickets, go HERE. Be a precinct volunteer. Contact Beverly Ring for more information at ringbeverly@yahoo.com. Knock on doors for a Democratic candidate. 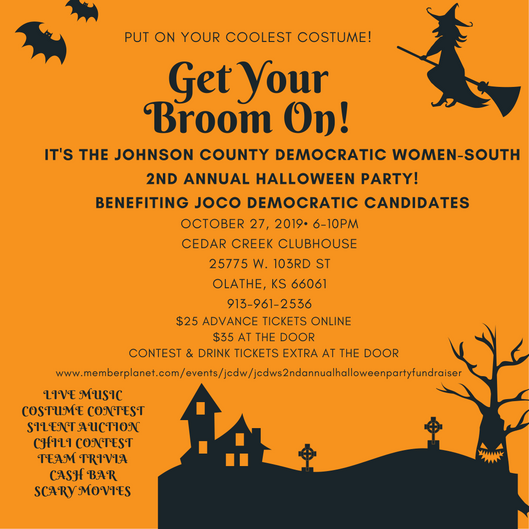 Donate to a Democratic candidate in Johnson County. Learn more about issues in your local area by attending Democratic meetings like those held by JCDW North or South. Share everything you know with everyone you meet! Vote! Make a voting plan and vote early. To make sure you’re still registered, click HEREto verify your registration and see a sample ballot before you vote! Share widely!